So, I’m still working on The Witch Queen’s War. I haven’t been working on it everyday, but I’ve not put it aside completely yet, either. I’m hoping to work on it some more during Camp NaNo this year, as April’s project. I’ve put in my word count goal as only 35,000, since that’s going to be my last month of school, with finals on the horizon, so I need to be flexible. But, for once, I actually did an outline for the story. As in, I have most of the major, and several of the minor, plot points already worked out. I cannot honestly remember the last time I actually did an outline. It was probably back in senior English. And I don’t think I’ve ever actually done one for my personal writing before. I know that I’ve never done one for a NaNo project before. I start with an idea, and then I just sit down and type. In my mind, if the story is strong enough to keep coming out, then I don’t feel like I need an outline. If the story just kind of dies off, well, maybe I wasn’t in to it as much as I could have been. Or maybe the idea could have been better. When that happens, I never delete what I’ve written. I just shelve it and keep it stored in its own little folder on my laptop. It’s ready and waiting if I ever want to come back to it. Don’t get me wrong, I understand the advantages of having an outline. Otherwise, I wouldn’t have done one. When I do an outline, I’m usually trying to get something done within a certain period of time. And an outline can do that. 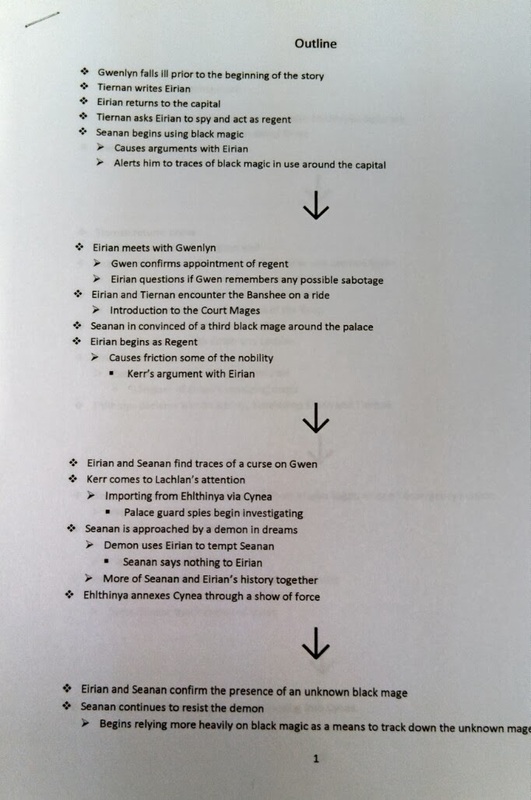 My outline looks more like a list than an actual outline, but I have plot points that I want to use, all laid out in the right order. That’s going to save me a lot of time. Otherwise, I’ll remember that I had a really great idea for a certain point, but won’t exactly remember where or how I wanted it to go, and that becomes tedious. Plot points still surprise you, they just do it when you’re writing out the outline, not the story. And that’s a little better than having it surprise you in a story. In an outline, you can easily rearrange plot points to incorporate any surprises and bursts of brilliance. It’s not as easy to do in the actual story, believe me. There’s a whole lot of backtracking and rewriting involved in that path. Also, with an outline like the one I’ve done, it makes it a lot easier to write scenes out of order, which I encourage if you feel like it won’t derail your own process. There’s no point in being stuck on a certain point, wasting time staring at a blinking cursor, when you can skip to another section and be more productive, then come back to the trouble spot later. And an outline makes it easier to go back and put them in the correct order. 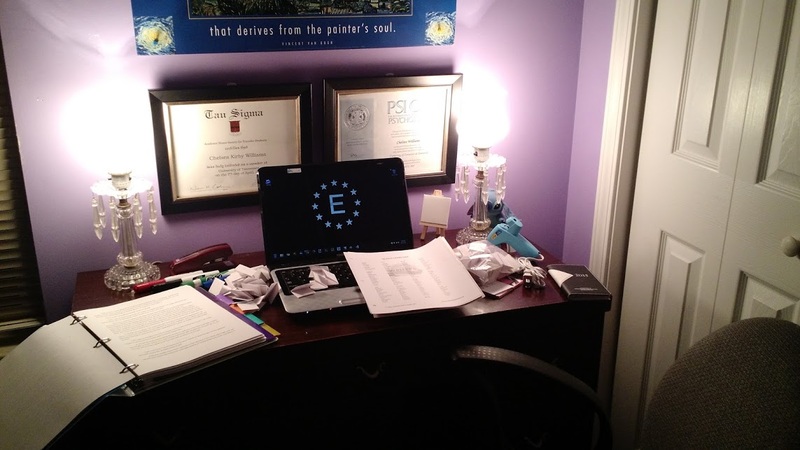 Both ways of writing have pros and cons, but when it comes to writing for a deadline, I’m beginning to think that an outline is the best option. I never thought I’d say it, but I might be converting from pantser to planner.